The following is listing of the size of relative global publishing markets, as developed by Austrian publishing consultant Rüdiger Wischenbart to illustrate his Global Ranking of Publishing Companies, a report produced in conjunction with our publishing partner PublishNews (Brazil) and numerous affiliated industry trade publications. It is part of a broader effort of the International Publishers Association (IPA) to develop a global statistical database for the publishing industry. The following is a graphic representation of the chart above. The Global Map of Publishing Markets is the first visual representation of publishing around the world by the numbers. The map demonstrates the way that books and the industry behind them reflect access to knowledge and to the opportunity to dive into the imaginary worlds brought to life by written words—where books are freely available and where books are hidden behind scores of cultural, social, or economic obstacles. The map and the data behind it provide a better understanding of the opportunities, as well as the challenges, in making reading and access to books universal. 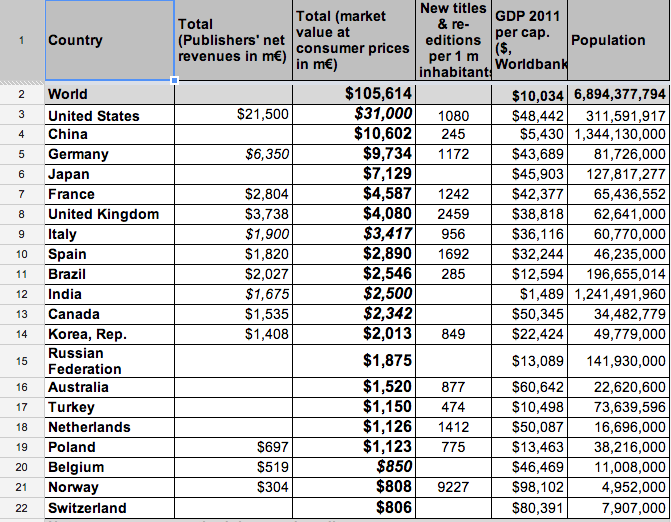 The 2012 Global Map of Publishing Markets displays a world of striking inequalities. A few countries form powerful centres of gravity, with several more–those which economists call “emerging markets”–shown at least relatively equal to their size in terms of territory and population. But the majority of markets are difficult to identify, lost in the periphery. Yet the Global Map of Publishing Markets and, even more so, the underlying data and research on market developments, do more than portray an uneven playing field. They can be used as a road map for anyone concerned with the globalization of culture, knowledge, and learning; they highlight huge opportunities for all those who are in the business of publishing and related industries. They hopefully serve as incentive and encouragement to stakeholders particularly in emerging markets and in lesser-represented regions. The strategic goal going forward is certainly adjusting this map so that in the future, the world of publishing more closely resembles that standard map of geographers and demographers—one in which countries have a roughly identical size with regard to their population and publishing market. The Global Map of Publishing Markets represents domestic publishing markets by market value at consumer prices. This angle has been chosen because it seemed to be the most robust, most researchable, and most basic approach in view of gaining an understanding of publishing around the world on an empirical basis. Many more diversified aspects obviously come to mind to organize such a map, and they will form further explorations of the theme laid out here. In this first attempt, however, our goal was simply to create a starting point. The initial research effort was launched in 2011 by the International Publishers Association (IPA), with additional funding from the London Book Fair and BookExpo America. The methodology and the research were developed and conducted by Rüdiger Wischenbart Content and Consulting. The first step was to gather as much available data as realistically possible from the best available sources to start a database logging three primary indicators: first, the total net sales by publishers in a market; second, the market’s value at consumer prices; and third, the number of new title releases and re-editions. The data relied chiefly on input from national publishers’ associations and related organisations. For most countries, either only publishers sales or the market value was, if at all, available. The new title releases and re-editions functioned as a first context figure. These first findings were then checked for errors and plausibility through a pre-release in 2011 and early 2012. The second step was to ask industry professionals – notably publishers, book fair organizers and regional intermediaries – for their critical assessment of the initial findings. A second body of data, primarily exports statistics from the largest exporting markets (UK, US, France and Spain), was added as a benchmark. This data was used to shed some light on regions that had little or even no publishing market statistics. The third step was to explore the context of publishing, as it turned out that publishing markets reflect socioeconomic parameters of a country and can be correlated in meaningful ways with population size and GDP per capita. This allowed us to develop an initial (and still experimental) algorithm to systematically estimate the size of publishing markets for which no empirical data are available. These estimates were then cross referenced with respective numbers from countries with reliable data and with assessments by local experts. The resulting table of retrieved and estimated values were visualized with the Worldmapper toolset (www.viewsoftheworld.net). Special thanks go to Dr Benjamin D. Hennig from University of Scheffield. Further details on the methodology will be published separately. The data gathering effort for the Global Map of Publishing Markets 2012 could never have succeeded without the exceptional support, energy, and contributions from publishing professionals and trade organizations in countries and regions worldwide, who helped by making data available, reviewing interim results and critiquing, and by additional innovative efforts to add data with the ambition of improving the results of this initiative.